An Army Of Affiliates To Promote It For You! 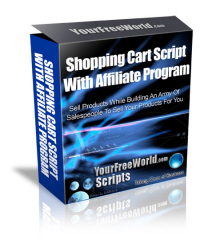 Whether you want to sell digital or physical products, this fully featured shopping cart script is the perfect solution for managing your business. With a simple, straightforward administration area, you can add as many categories and products as you wish, view pending order, past orders, and email customers. But even better, you can attract affiliates to promote your online store, and make either a percentage commission or flat rate commission per sale down to 3 levels as preferred. Emailing affiliates is as simple as clicking a few buttons, and typing in your message. This quality script includes built-in product search capability to enable your customers to find exactly what they're looking for quick smart, and shows featured products with associated images. You can even offer up to 5 merchant programs for the convenience of your shoppers. Truly a jam packed script with many attractive features that you should check out today! Paypal and Payza compatible and you can also add 5 more merchant accounts of your wish. 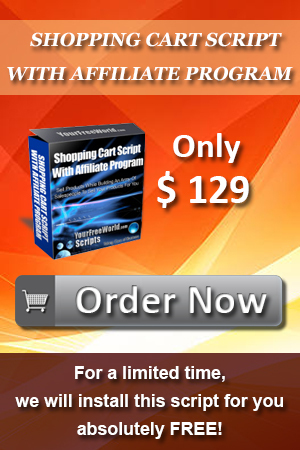 Completely Customizable affiliate program upto 3 levels.